Just finished smoking Full Virginia Flake in a slight bend 1968 group 4S Dunhill Shell 475 cherrywood. Next is Fox and Hound in a 1975 full bend black Dunhill Shell 52021. Telegraph Hill in my old reliable 1986 smooth Peterson Kildare 999 Rhodesian. Virginia Woods in a smooth full bend 1977 Crown Coachman 215 egg (Charatan second). Old Vienna in a 1979 no name French briar smooth full bend egg. South Seas in a straight 2012 Rekamepip made Sugar Barrel pipe. 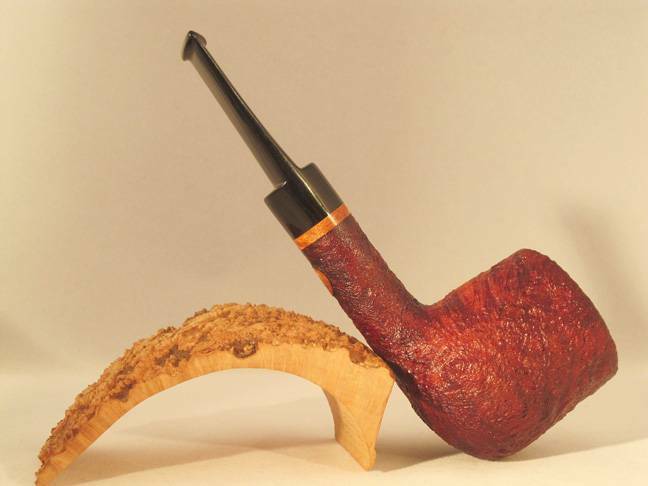 Rekamepip's Pressed October Blend in a 2013 slight bend grain etched briar Rekamepip Volcano with a walnut shank. Marlin Flake in a Dunhill. Capstan flake(gold) in a Dunhill cumberland apple 4101. Davidoff English Mixture in a straight grain apple by Briar Spirit Pipes. Sherlock Holmes VR Club Blend in my '78 Pete 307 Silver Spigot. Briggs Match in a straight sandblasted black billiard 2013 PSF POY Kaywoodie with an amber colored lucite stem. Wessex Dark Flake in a 1984 black sandblasted straight Dunhill Shell 4103 Billiard. Voodoo Queen in a 1990 Peterson Irish Second Oom Paul natural. Odyssey in a MM cob, nice relaxing evening.